Now you can have peace of mind with style in our 9mm stainless steel Italian Syle starter link expansion bracelet. 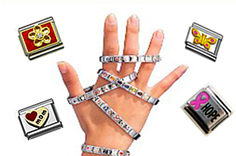 Have fun personalizing your bracelet with extra charm links sold seperately. Shown here with pink links. Medical Tag flips over for easy access to your life-saving info. 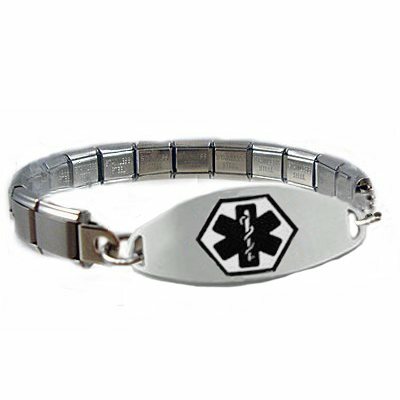 Price includes one Contempo stainless medical id tag with free "black laser" engraving, one starter link bracelet + 2 extra sizing links & FREE charm key tool. No further discount on this laser engraved bracelet. 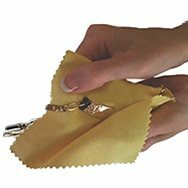 #2 Measure Your Wrist - Do NOT add any length when selecting wrist size below. We will send the correct size for a comfy fit.